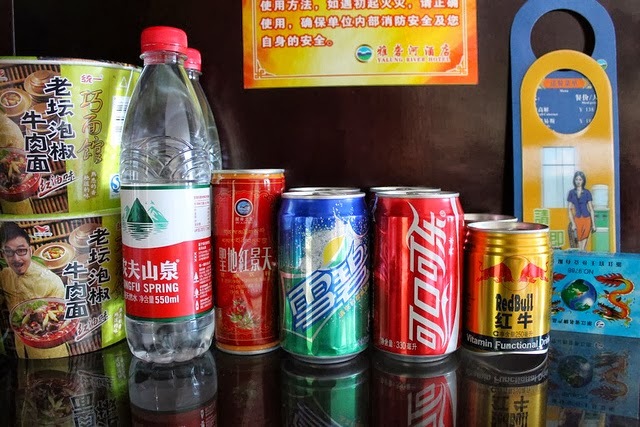 One of my gripes about Beijing is the lack of "good" pop. Or whatever you call it in your part of the world. Yes, this is probably better for me in the long run NOT to have access to my addiction of Diet Coke but damn I want it! So you have a couple choices here, local pop, which is Coke, Coke Light, Coke Zero, Sprite, Pepsi, Mountain Dew to name some of the most popular. Coke is definitely more popular in China. 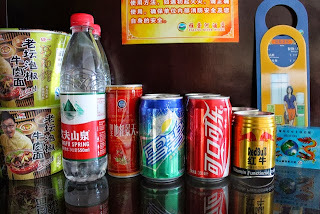 You can find these by the can for around 2RMB, which in US$ is $0.30/can. So $3.60/12 pack. Ironically this seems cheap to me now, when in reality I NEVER pay more than $3.00 for a 12 pack in the US. Not having US pop may not seem like a big deal to you casual pop drinkers, but the reality is that they don't use the same sweeteners which makes the pop taste off. When I first visited and moved here I wouldn't even drink local or imported pop, it just tastes gross to me. Coke tastes different all around the world, depending which country you are in. Sadly, I now drink the stuff for lack of other options. Here are some pictures I took at the local store. I'm not sure where either of these are from but they are imported as you can see by the price. What I thought was funny about the Pepsi cans is that they have covers on the tops. I'm not sure what this is, maybe flavored water, but it reminded me of the Pepsi Clear back in the day. Not sure if you can tell but those are see through cans. Don't even think about finding Diet Coke, Diet Mt Dew, Diet Pepsi, Sprite Zero or even most of those options in caffeine free. Pepsi is the only thing I've seen caffeine free, but it isn't American. I have seen Dr. Pepper and Cherry Dr. Pepper, but rarely do you see Diet Dr. Pepper. It is all very random. Nice blog!! Thanks for posting it.